Apologies for late update, due to change of administrator. Tonbridge Judo Club are pleased as always to announce the forthcoming training camp at Tonbridge School organised by Chris and Carl. This year we are proud to announce Chloe Cohen Vickers, GB International and top coach, will be leading the new junior sessions, for this we are really grateful, this will be a fantastic learning opportunity for all aspiring young players. Look forward to seeing you all there as always. You will need to bring your licence with you. If you are staying for Saturday training you will need to bring a packed lunch. SATURDAY 27TH JANUARY - NO TRAINING! There will be training as normal on Wednesday 20th December. The is also an extra training day on 28th December, which will consist of two 1.5hr sessions. Registration at 10:30am and training from 11am - 3pm - this will cost £12 for the day. Usual training will commence on Wednesday 3rd of January. 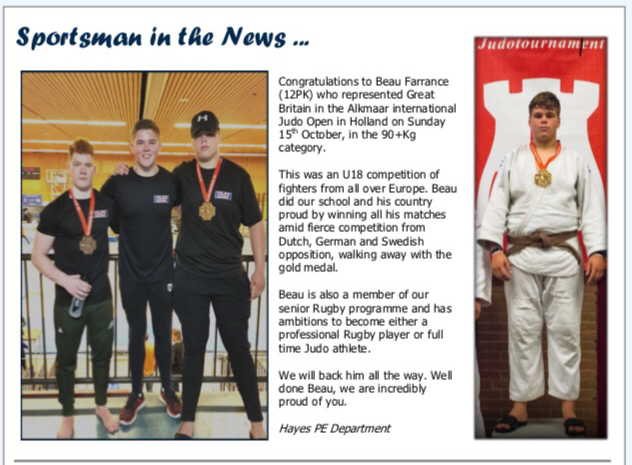 A super article from Hayes School in Bromley expressing their pride in Beau's acheivements! Fantastic to see such solid support from a school!